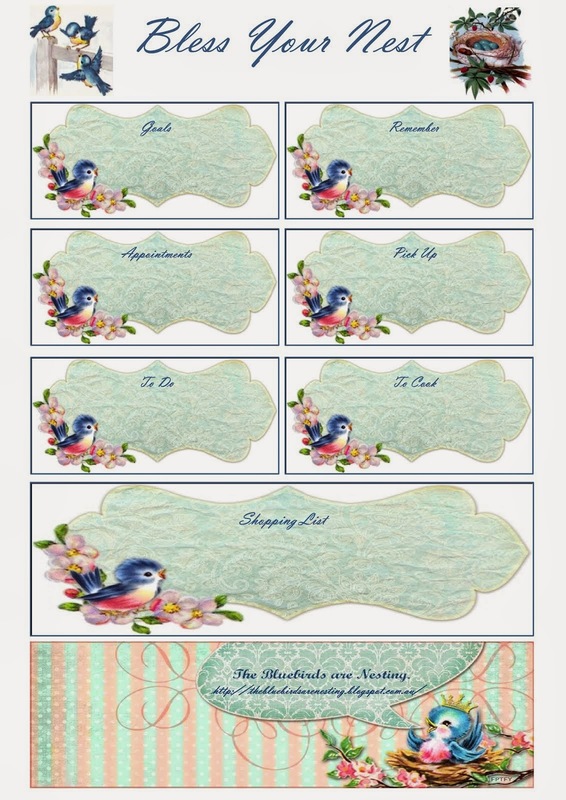 The Bluebirds are Nesting...: The Tuesday Afternoon Club, 12 February, 2019. The Tuesday Afternoon Club, 12 February, 2019. What a fortnight it has been! The Tuesday Afternoon Club has grown and grown. Here I am posting for some of the girls that for one reason or another are not in the FB group. For many of us this is a benefit of a double dose of ideas! First of all we have Clare. She sent me a photo of her Melting Moments. Her husband thought she had gone to the shops and bought them. But no Clare has certainly perfected Melting Moments which she made for her parents visit. Quiche, meringues and CHOCOLATE CREAM! And there was more!! Maria cooks often for her Grandkids and family. You can imagine how much they love this! Next we have Jen in NC. She is in winter and knitting away! 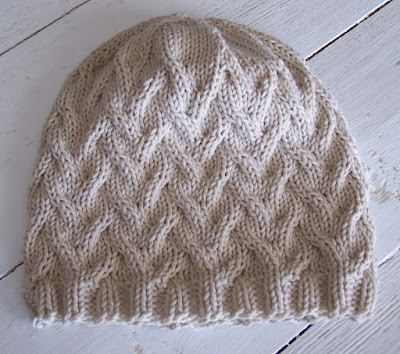 Beautifully, Jen has made hats for her neighbour undergoing cancer treatment. 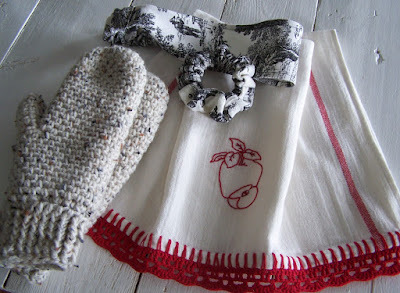 Then mittens, a headband, scrunchies and embroidered kitchen towel with a red crochet edging. Imagine all of these as gifts. Just beautiful! Jen your gift cupboard must be looking amazing already at this point! We often have boxes that have contained something we have purchased. 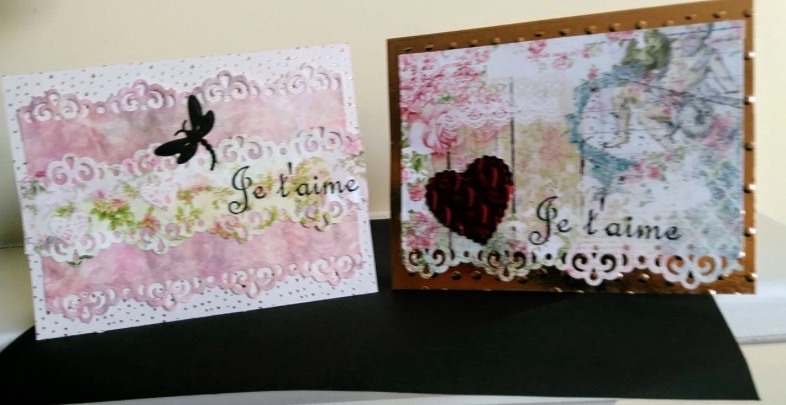 With some decorating they can easily become keepsake or gift boxes! They are just beautiful Cookie. I always keep and redecorate gift bags or store bags that are basically the same but have a store logo on them. They are really easy to turn into gift bags! Now gift boxes are another! Thank you for the inspiration Cookie! Thank you everyone for sharing what you made! Now I am off to post in the Facebook group. If you would like to join come over to The Tuesday Afternoon Club. Labels: The Tuesday Afternoon Club. 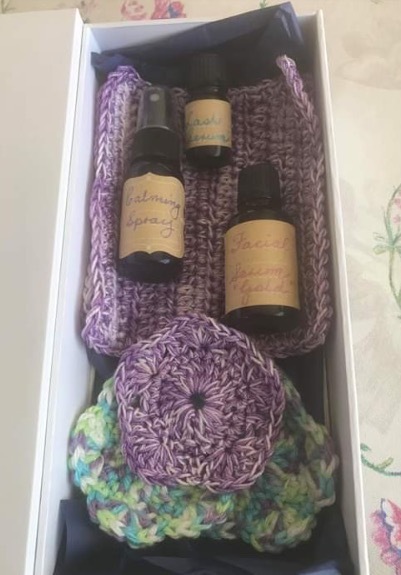 Thank you Annabel for posting all of these lovely handcrafted items :). Wow they are all gorgeous and Maria you have outdone yourself with all of that lovely cooking and baking :). I will send you some photos of things I have been making too Annabel. It has taken us a while to get settled and get a few needed maintenance jobs done in the house before I got to sewing :). Have a great week ahead everyone :). Yet another beautiful array of things from the Bluebirds. 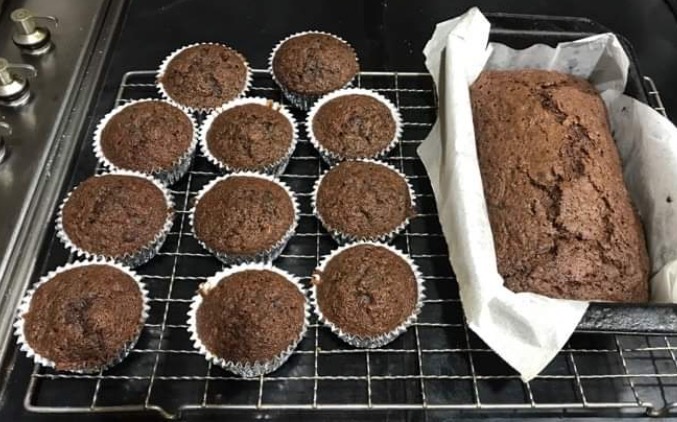 Clare and Maria's baking looks so delicious. And Jen's knitting and embroidery just perfection. And thank you for showing my cards and boxes. I had so much fun making them. 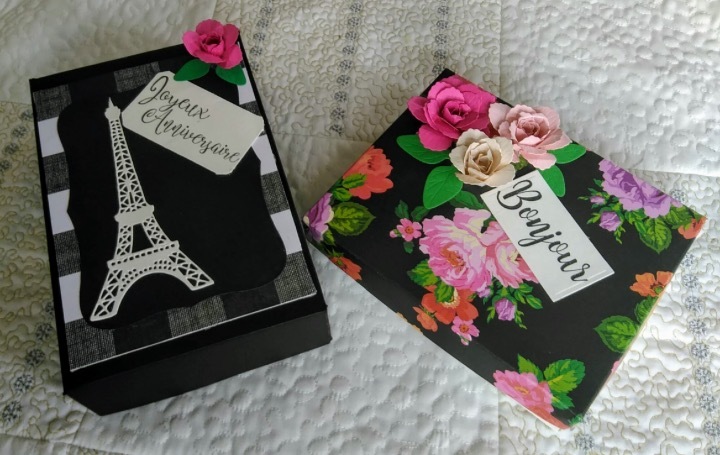 I actually constructed the boxes myself from cardstock and then decorating with papers that I had and paper roses that I made, as well as other goodies in my stash. 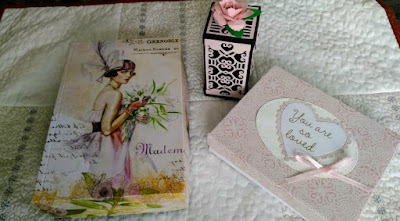 There are great tutorials on youtube that show you how to construct a gift box from from card stock or water color paper should anyone be interested. They're quite addictive. The last two weeks seem to have slipped by me craft wise! I have been mostly in the kitchen trying keep on top of the garden produce, plus using things up. But I have joined Patsi's 100 day sewing challenge so now I have extra motivation! Well done on the cooking, baking and crafting ladies! Everything looks absolutely wonderful and is sure to go over very well. Maria and Clare, your photos make my mouth water! All of your goodies look delicious and pretty too. Jen, I always love to see your knitting. 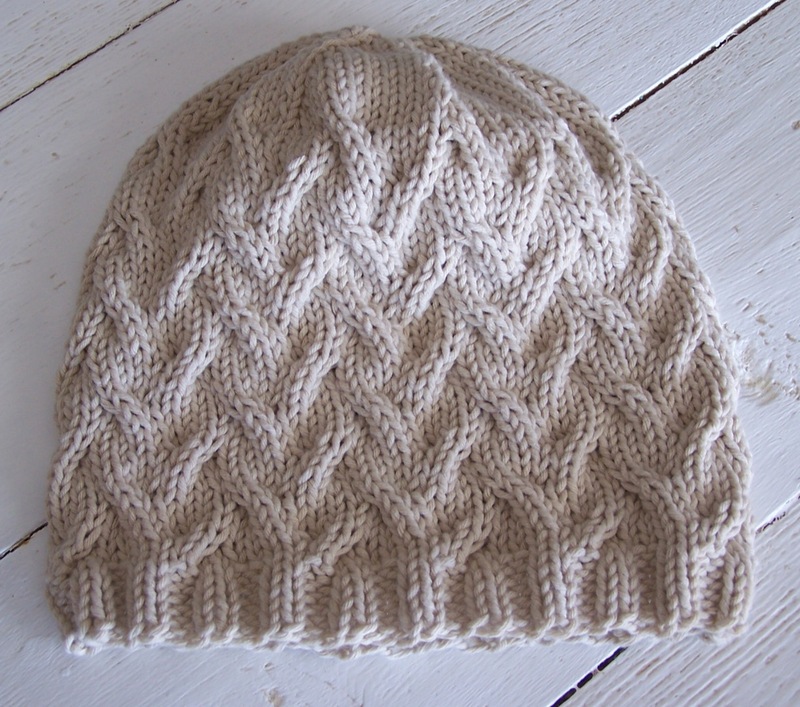 How kind to make hats for your neighbor. Cookie, you have excelled in your paper crafting. 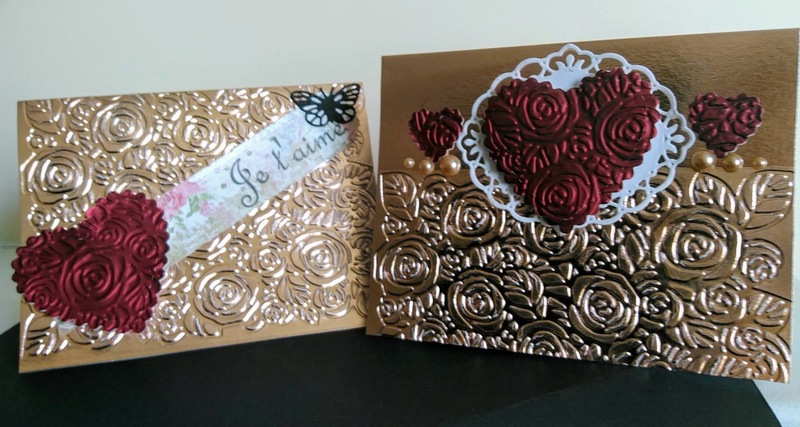 Your cards are beautiful as are the boxes you made over. Lovely baked goods and beautiful crafts. I so enjoy seeing what everyone is doing. 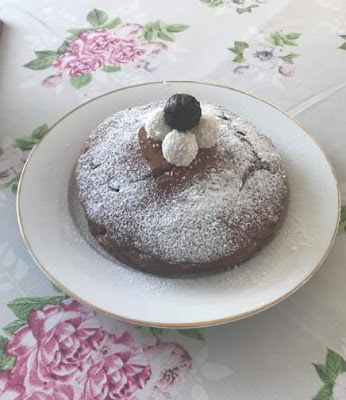 Thank you, Annabel, for posting to the blog, also. I am one of those people who avoids Facebook, but am so thankful to be included in the Tuesday group via the blog. Such beautiful items showing such care and love and I just love the little box filled with gifts of care! Baking for the family or friends, care package for sick friends, knitwear so exquisitely made and sweet Valentine cards of love. I just love that idea of decorating gift boxes Cookie. I never thought of doing that! What a lovely array of gifts! 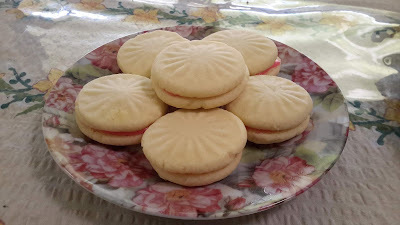 Those melting moments look to die for, and Maria, you are the baking queen!!! Cookie, your talent always astounds me...it must take a bit of patience to make those boxes before you get to the fun part of decorating! :) Thank you everyone for your kind comments. I am having fun and definitely keeping motivated by have a deadline for posting here!!! Today we're having a snowstorm, so in between shovelling bouts, I think I will make some Valentine cards and do some embroidery! It is so fun to see everyone else's work! I am absolutely loving every ones work it is a pleasure to look at, I have knitted more washers, and the other day started back on my red and white hexie quilt. 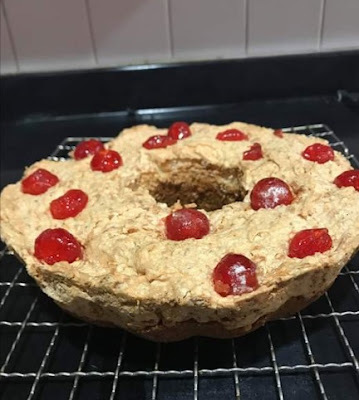 I have 2 birthday presents for this month, one sil and the other our eldest grandchild turned 18, so tis is a special one. 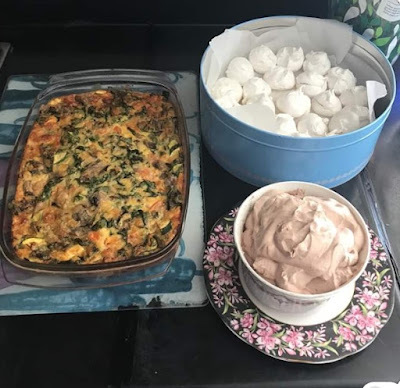 Dear Annabel , thankyou for posting my cooking and makes , Im late here had a busy few days , although I must say I feel guilty for syaing that when I read how much many of you and Bluebirds are doing, I am a far slower worker . Clare's melting moments look so good and professional too, well done Clare! 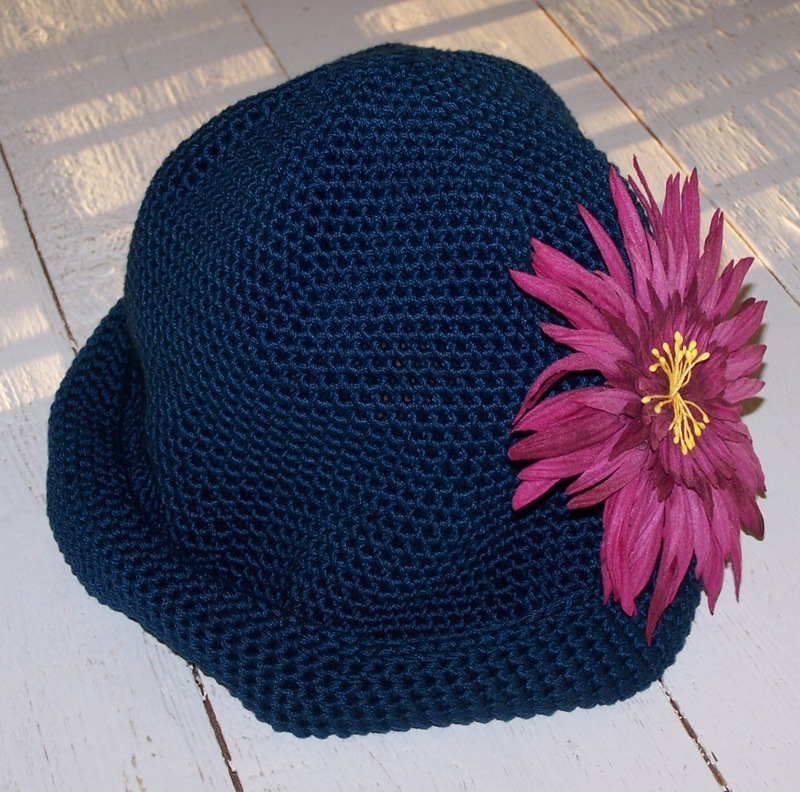 Jen your hats look cosy and well made , im sure your friend apppreciated your kindness makign these for her . 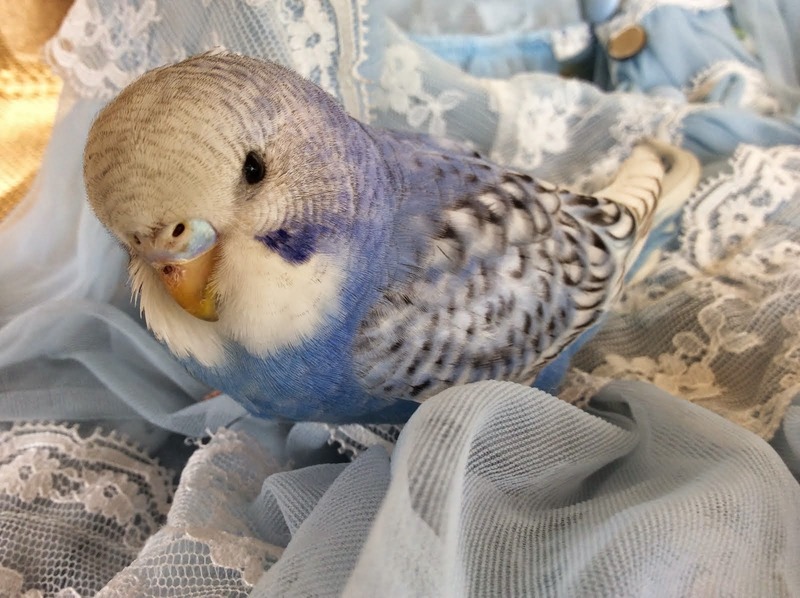 Feather your Nest Friday, 1st of March, 2019. Feather your Nest Friday, 22nd February, 2019. Feather your Nest Friday, 15th February. 2019. Feather your Nest Friday, 8 February, 2019. 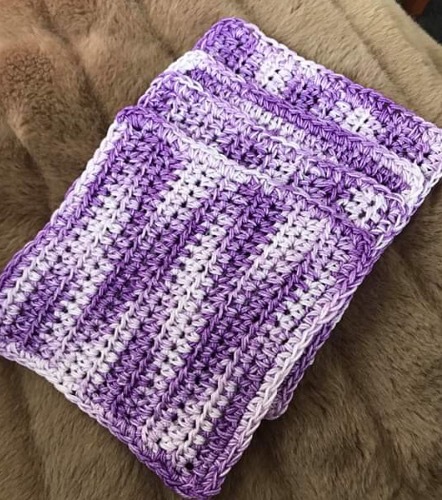 A pretty and easy crochet edge.